I want to share my experience of using a woodstove to bake potatoes. 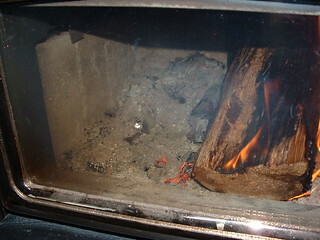 We use a woodstove to heat our home and I wondered about using the woodstove for baking potatoes. It’s already hot and has room inside for baking so why start up the oven for baking potatoes when I could use the woodstove. So I set out to try out my idea, first you want a hot woodstove that has burned down a bit and has hot ashes that you can use as a bed for baking the potatoes. Next double wrap the potatoes in foil. Move the fire over to one side of the stove as you want to place the potatoes in hot coals and ash but not directly against any burning wood. 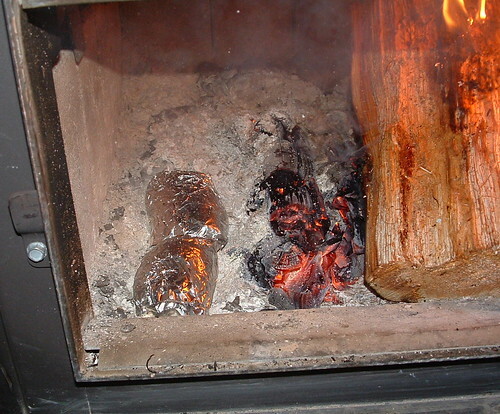 Here is a photo showing my two potatoes wrapped in foil and placed inside the woodstove. As you can see, the potatoes are on the ash bed with the burning wood moved over to the side. After placing the potatoes inside the woodstove, cover up the potatoes with some hot ashes on the side of the firebox as shown in the picture below. I use my small stove shovel to scoop some ashes cover the potatoes to help them bake evenly. In about 20 minutes, turn potatoes over and cover again with ashes. My large bakers were done after about 45 minutes in the woodstove. Using a potholder, squeeze the taters to make sure they are done and then remove them carefully using a thick potholder or heavy leather gloves as the potatoes are very hot. The results are some wonderful baked potatoes that are very tasty. This useful idea produces great tasting baked potatoes but also is very useful should you have a power outage. Plus it saves energy by reducing the use of a traditional oven for baking. Very neat idea! I don’t have a wood fireplace, but I wonder if I could do that in my charcoal bbq? Hello and yes I would love to trade ideas. I will send you an email. Thanks for visiting my blog. Thank you..my email for anyone wanting to openly share or trade ideas is: lenahan1@msn.com. I use the woodstove for baked potatoes, sweet potatoes, and onions. I .also occasionally put in a slice of butter or margrine to melt inside the onion or potatoes.